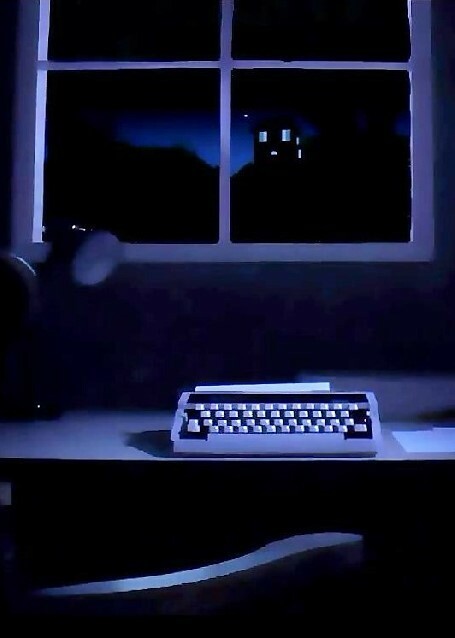 Working to finish her book, an isolated writer receives a visitor in the middle of the night. Is this an intervention or are her growing fears about to be realised? The Five Lights was the last film that freezedriedham made. Unusually at the time we had some money to spend on making a film, but no idea of what to make. We read about an upcoming Halloween film challenge, which seemed like a good thing to go for; at least we’d have a deadline to work to (which could only increase the chances of us actually completing the project). The only constraint on the story that could be told (other than it had to be some kind of horror) was that it should incorporate the number five, or something like that. Our shortlist of titles was equal parts tenuous and ridiculous. We plumped for the one about the five lights that lived on a hill, which when extinguished would signal the end of the world for our main character. Moody. Incidentally, by the time we’d put ourselves into making the film we only had five weeks in which to do it. The script then needed to be written very quickly, and so it was, me trying to tell a brooding story of psychological dread set in the mind of a writer isolated in her lonely retreat. This is a story for which I could have drawn empathy from the uncanny parallels to my experience writing the script it had if a) there was more time to be thinking about these things and b) if it were true. Anyway, we now had some stuff written down so at least we could say what cast we’d need and where we’d need to shoot it. Where we wound up shooting the film wasn’t a million miles away as it turns out; it was where we lived. Strangely, considering our history of low/no budget filmmaking, I’d never shot anything in a place I lived in while actually living in it. Probably won’t again either. There’s likely not a better way of gaining an appreciation of how much stuff can be needed to make even a small film than having your bedroom used as a kit store. It was everywhere, and in piles. We took pleasure in spending our limited budget on toys we’d never played with before; a real dolly and track, a gib, a real greenscreen. The additional cost to the hire charge it seemed was the very real danger of impaling oneself on a c-stand on the way to the bathroom of a morning. Also on my wish list, and crow barred into production on the grounds that finding real exteriors and shooting them in October would be a pain in the arse, was shooting miniatures. Probably best not to shoot them with a massive camera meant for real-life people: small things= small camera. So our living room became our little soundstage, and it would require a little dressing to look the part. The fact we were rented tenants put a bit of a limit on what we could do with the place. We got round the problem of the bright blue walls by pre-painting rolls of wallpaper and safely sticking it to the walls with lashings and lashings of creamy blu—tak. I got to bust out some carpentry skills to build a fake window, which was doubtless a pleasure for the neighbours. Other pleasures for them included the massive tent of blackout cloth that sat of the front lawn for a weekend and the continuous comings and goings of more people than it should be possible to fit into a two bedroom flat. All that aside we were awfully discreet and received no threats from the resident’s committee as far as I know. As ever the hours we planned were long, and as ever things took even longer to do than anticipated. It was a jolly little cast and crew, despite our best efforts to squander the goodwill of our actress by tagging a 3am exterior scene in zero temperatures onto the end of the last day’s shooting. Bless her.